As a business to business printer located in San Diego, at Replica Printing we are always looking for ways to help our customer’s businesses grow and thrive. One of the best and easiest ways we help some of our customers do that is through printing their yearly or quarterly catalogs to promote their products. One main misconception about catalogs is that they’re outdated and shouldn’t be used in modern marketing budgets, but that couldn’t be further from the case. Yes, catalogs can come across as an old medium for a business to try to sell their product, however what the trends are telling us as a printing business is that catalogs are here to stay and have to be adjusted to remain modern enough for today’s market. In both business to business and business to consumer markets, printed catalogs have experienced an incredible revival as brands and marketers realize their power to impact consumer behavior. 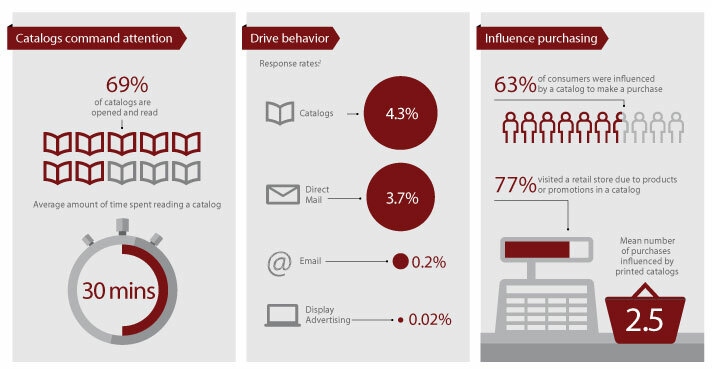 Here are some statistical reasons why catalogs remain a major factor in consumer behavior. 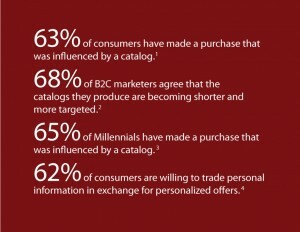 The statistical evidence shown above proves that catalogs still remain a big player in various ways. The three main things the infographic does a good job of showing is that catalogs command attention, drive behavior, and influence purchasing, all these factors make catalogs a very viable option to market business now and in the future. These numbers also provide evidence that having something tangible to give or send out to the customer is valuable. 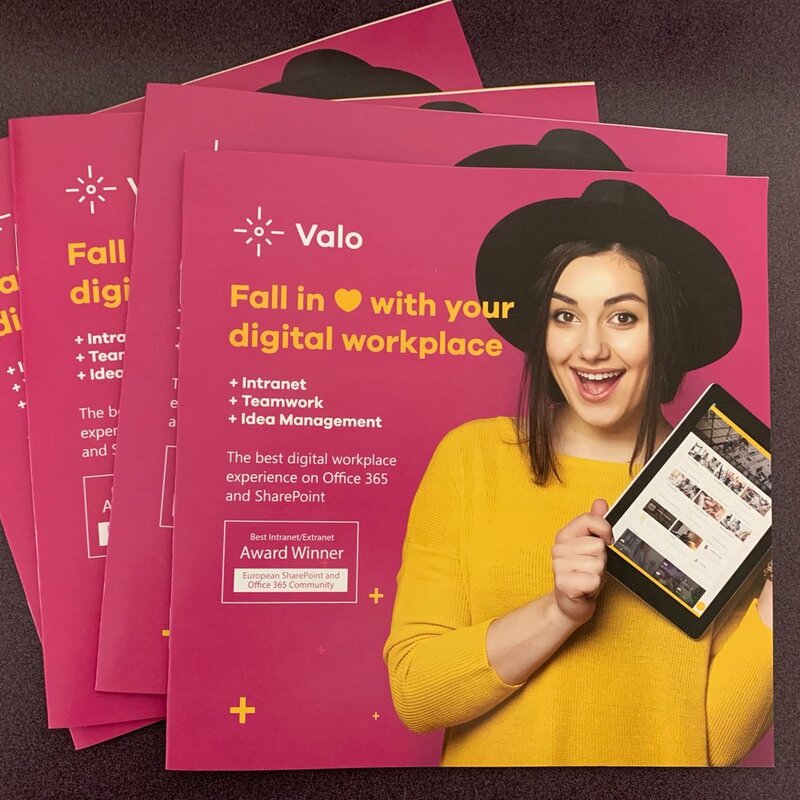 A printed catalog gives your customers the ability to hold something physical in their hands and see your products up close, without the barrier of a computer screen. This does not discourage customers to go online to your website, it in fact directs the consumer to the website link and encourages customers to search for the product they found in the catalog on your website. Brands use catalogs as a vehicle to strengthen customer experiences and loyalty while driving online and in-store sales. By 2019, more than 40 billion color catalog pages will be printed annually on digital devices in the U.S. and Western Europe a compound annual rate of 29%. 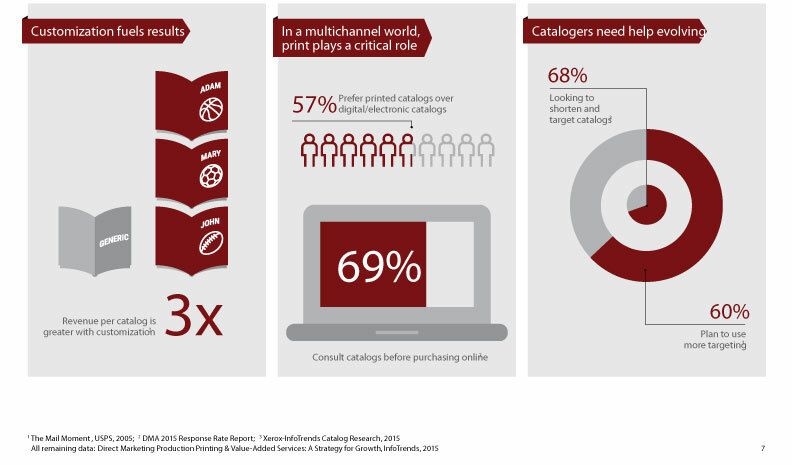 This shows that not only does the catalog industry still exist, it is on pace to continue to grow and thrive up at least until the next decade, it shows catalogs are still a big medium for print and for businesses to grow. Rather than sending static or versioned catalogs the economies and capabilities enabled by inkjet printing are making it feasible for retailers to add personalization and relevancy to catalog covers, inserts, and offers. 69% of consumers consult a printed catalog. Segmented catalogs with fewer pages are the trend. Using past purchases or seasonal items in geographic regions is another popular trend. One way generate more traffic is to put up your catalog on other digital channels like email and web. Catalogs may not be thought of as futuristic, but they are not going anywhere in the near future. Contact us for all your small business catalog printing services! Once you’ve decided that you want to get started on a catalog for your small business, contact us today! Ask for an account manager to help you get the exact catalog you need for your small business. Plus, if you’re in a hurry to get your catalog printed, Replica Printing also offers same day/next day printing for all orders and free delivery for orders over $100. Call us today at (858) 549-5380. Previous Post Why Do Printers Use CMYK? Next Post A Place for Print in a Digital World? Awesome blog. I’d like to share my personal experience about london paper bag.London Paper Bags are specialist bag printers and suppliers to the Promotional and Retail sectors and we have an extensive selection of bags available from stock or custom made to suit your needs, printed with your design and delivered on time.